David Bertram Hill was born on July 11th, 1923, in Leeds, Maine. Little is known about his life prior to his service, but before entering the military service, David worked at the D. J. Daris Company in Auburn. 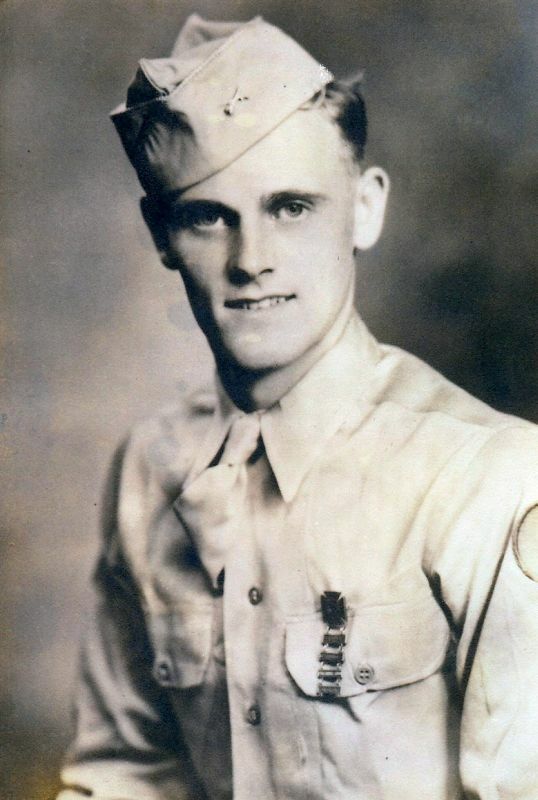 David entered the Army on January 26th 1944, and got his training at Camp Wheeler, Georgia. In July 1944 David went overseas as part of 1st Battalion, Company B of the 60th Infantry Regiment. He went to England, and fought in France and Belgium. We can assume that David fought in the battle of the Hurtgen Forest as well during September and October 1944. 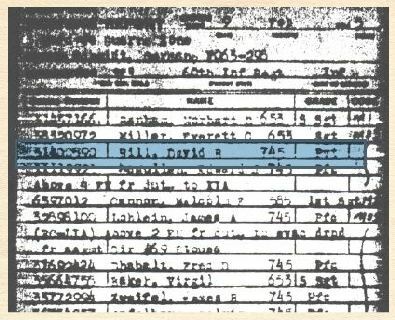 David was transferred to 2nd Battalion, Company F of the 60th Infantry Regiment on the 1st of January, 1945. On February 9th, 1945, the regiment moved out shortly after midnight, and met with some heavy resistance around 5:30 that morning, 1000 yards after taking of from the line of departure. The enemy had infiltrated through the first houses of Schmidt and placed heavy small arms fire on the forward elements of 2nd Battalion. After overcoming this first attack, Company E and F advanced several hundred yards, and were fired upon again by heavy small arms fire and self-propelled fire. The enemy was firing from the higher ground to the east. While Company E made a left flanking movement, Company F with PFC. Hill advanced in a right flanking movement. Both Companies were pinned down as they approached the higher ground. After a minesweeper tank helped the Infantry to create a path through the minefield, enemy tanks and troops withdrew, making another advance for 2nd Battalion possible again. When another enemy attack came from the left flank and was repulsed again. According to the Report of Burial, David’s cause of death was that he got hit in the chest by shrapnel. We can assume it was during one of the actions towards the higher grounds near the town of Schmidt when this happened. His name appeared on the Morning Report the next day. A German Captain that was captured claimed that there were 600 German Paratroopers opposed the 2nd Battalion, and that their attack would be in vain. This turned out to not be true and 2nd Battalion managed to take the hill, and now had the higher grounds they needed to push further and take control of the Roer River Dams. David’s parents received the telegram of the loss of their son while David’s brother, Private Ervin M. Hill was also in the Infantry, training at Camp Wheeler. Shortly after the news reached them, an article about Private David Hill was also published in the local newspaper. Pvt. 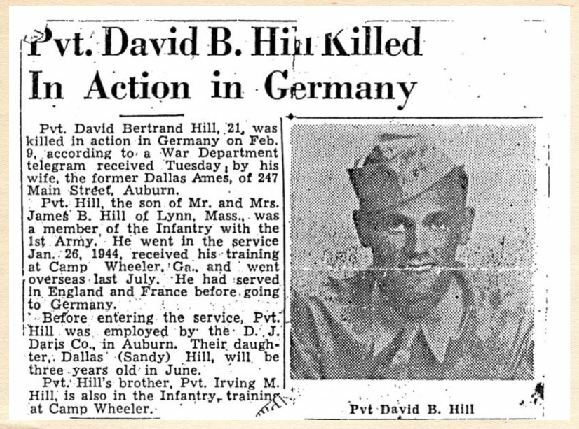 David B. Hill was buried at Henri-Chapelle in Belgium on February 23rd, 1945. 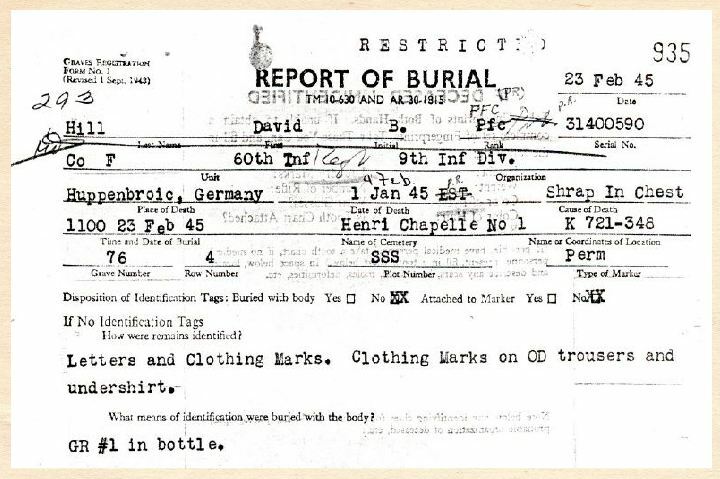 David was then dis-interned in 1947 and returned to the United States to be reburied in Mt. Auburn Cemetery, Auburn in Maine where he still rests today. David was only 21 years old when he passed away, and will never be forgotten.